Flame Retardant finish to protect, seal and decorate over ISS intumescent Steel Coating or 2 coats of ITC intumescent paint for 30 or 60 mins. Maintains Class O on primed non-combusible surfaces. FR Paints assist in the control of fire hazards caused by combustible materials such as wood and paint in buildings by releasing a flame extinguishing gas upon contact with a fire. Gloss: BS 4800, plus RAL. Eggshell: BS 4800, plus RAL. 2.5 and 5 litre packs. SFR dualcoat releases a vapour to suppress toxic gasses and prevent flame spread. When used with ITC intumescent paint, the SFR dualcoat provides a durable hard wearing, weather and wash resistant fire protection system. For decorative interior and exterior timber surfaces. 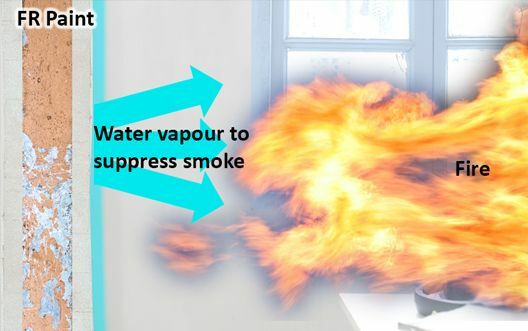 SFR dualcoat timber meets new Fire Regulations standard BS EN Class B s1 dO and complies with Class O.
SFR wallcoat releases a vapour to suppress toxic gasses and prevent flame spread. When used with IWC intumescent paint, the SFR wallcoat provides a durable hard wearing, fire protecting system for internal walls. SFR wallcoat meets new Fire Regulations standard BS EN Class B s1 dO and complies with Class O.